The Archbishop of Canterbury's report 'Faith In The City' is published. The first Nightstop in Leeds is launched as part of the local ecumenical churches response to the "Faith in the City" report. The Bradford Nightstop Steering group is established and they research the need for a Nightstop in the District. In June two workers are appointed and work from an office in a garage. On 11th October the referral lines are open for the first time. Soon after the first young person stays on Bradford Nightstop. Nick Raynsford MP speaks at public meeting organised by Bradford Campaign for the Homeless and Rootless (CHAR). 'Nightstop' is registered as a Trade Mark by the Nightstop National Network. Marcus Fox MP (Shipley) is presented with a park bench to encourage him to think and act on the issue of youth homelessness. Bradford Nightstop organise a 1,000th Nightstop Week. Tony Robinson visited the City Centre 'Sleep Out' event and 1,000 balloons were launched in Centenary Square by Rev Paul Booth - the first Bradford Nightstop Chair. In the same week a postcard for election candidates to express concern for homeless young people collects over one thousand two hundred signatures. Bradford Nightstop organise their first collection at Bradford Bulls and their first publicity stall at the Bradford Festival Mela. Several volunteers and staff participate in the National Nightstop Conference. The first education worker is employed to work across the district on housing and homelessness issues. Bradford Nightstop are featured on National TV on a programme called 'That's Esther'. Bradford Nightstop chair a subgroup of the Young Person's Housing Consortium. The group organised a Consultation Day on the housing and homelessness needs of African Caribbean and Asian young People in the Bradford District. A report was produced with action plans to influence local policy and practice. Publicity events include a Homelessness Street Party in Centenary Square and distributing Calendars at the Mela. Volunteers are taken on an Agency Tour to develop their understanding of the referral and follow up partners. A new teaching and video pack in partnership with City Centre Project is launched at the Nightstop UK conference. New one to one volunteer induction training and mentoring by more experienced hosts is launched. Bradford Nightstop receive an award from the Big Issue. Bradford Nightstop is one of the five winners in the Guardian Charity Awards out of 400 entries. Bradford Nightstop marks it's Ten Year Anniversary at their 2003 AGM. Volunteers are presented with certificates by the Bradford Lord Mayor. New designated worker training is rolled out to 53 workers to ensure that agencies are better equipped when they make referrals to Bradford Nightstop. The Nightstop UK anonymous database is up and running improving the analysis of data which can be looked at both locally and nationally. A new partnership arrangement between Bradford City Centre project and Bradford Nightstop means that a young person can be offered an emergency room in the hostel if there are no hosts available. New education funding results in extensive work in secondary schools across the Bradford District reaching almost 2,200 13-25 year olds. A new volunteer driver's scheme is introduced to transport young people to hosts. Volunteer Drivers Guidelines are developed by volunteer TCP's, Hosts and the staff team. In partnership with Bradford Youth Service young people using Bradford Nightstop are offered safe spaces to wait in 'Youth Cafes'. Bradford Nightstop is featured on national and local radio, in the local papers and on TV all in the same week. 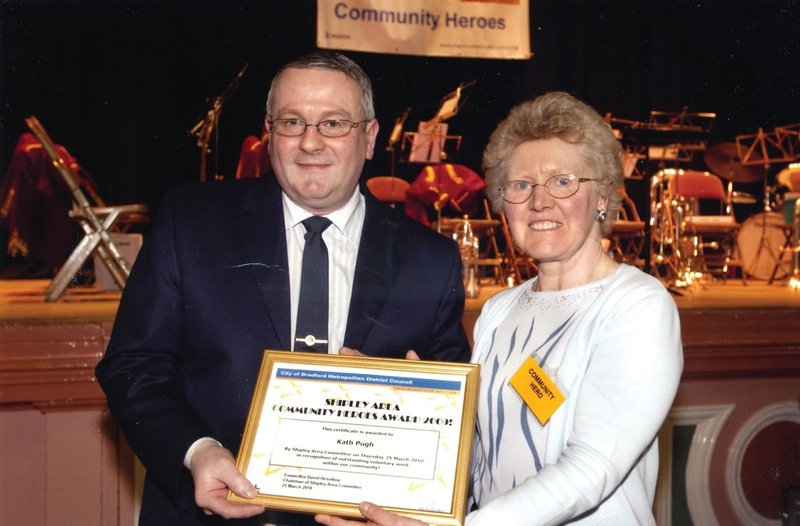 Volunteer Kath Pugh who started training as a TCP in 1993 is presented with a Community Hero Award. 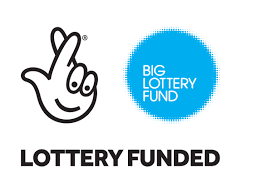 Five-year lottery funding is awarded for the Preventative Homelessness Project. Nightstop Plus is developed to provide 3-week stays for 16 and 17-year olds – a service welcomed by Social Services and Leaving Care agencies among others. White Rose Framework is tendered for and secured, making Nightstop Plus a registered provider option to statutory referring agencies. Production of new Nightstop Film, Opening Doors, featuring several young people who have stayed on Nightstop and volunteers. It is premiered at the National Media Museum to an audience including Bradford City player Andrew Davies, Bradford's Lord Mayor and Council Leader. Special General Meeting held to vote on a new constitution. White Rose Framework is successful and hosts are recruited for Nightstop Plus. Nightstop provides its 10,000th Bed Night. 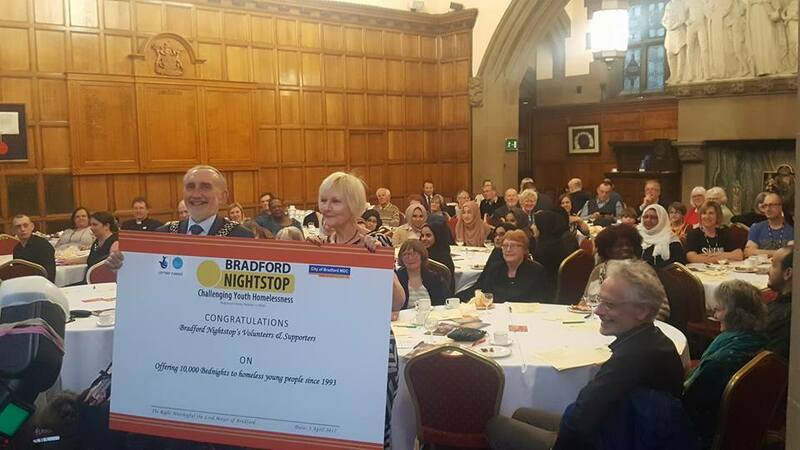 Bradford Nightstop smashes its 15,000 target number of students reached between 2012 and 2016, reaching over 17,000. The Lord Mayor and Mayoress of Bradford welcome Nightstop into City Hall for a Civic Reception to mark 10,000 bednights offered. Councillor Geoff Reid was delighted to host the charity, having been a volunteer host and Vice-Chair of the organisation himself.